Come out next Friday (3/22) for a Free community movie night! Bring a blanket, chair or cushion to sit on. *due to licensing restrictions we can't mention the name of the movie. You can however contact us and we can let you know. Join us for a group Bible study starting Thursday, February 28th. We will be studying the book of Philippians and learn lessons of joy, humility, service, generosity, encouragement, love and peaceful living. We will apply time-honored truths to our current situation and learn how to manage problems, build relationships and experience spiritual growth. Classes will meet on the 2nd and 4th Thursdays of each month at the Waterbury Area Senior Center. 14 Stowe St. in downtown Waterbury. Group meal at 5:30. One-hour class starts at 6:00pm. The class will be geared towards adults, but will suitable for ages 12 and up. Childcare will be provided. Please contact Brian at vtplant@gmail.com or 802-272-5262 for more information. 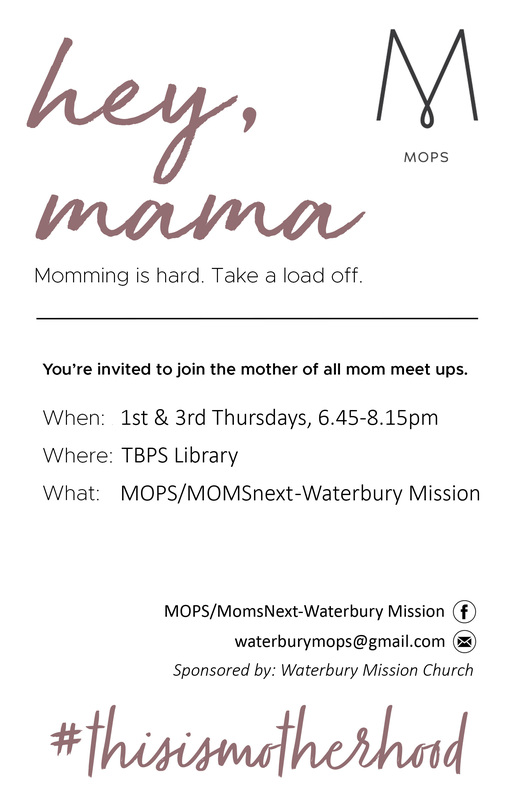 MOPS and MOMs Meets every 1st and 3rd Thursday of the Month!